OMEGALUX™ ceramic heater plates provide surface temperatures of up to 980°C (1800°F). 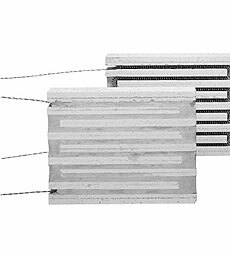 The large, 16 mm (5/8") ID grooves permit the use of exceptionally heavy gauge heating wire for low element watt densities and high wattage per square inch of radiating surface. The elements can be imbedded in ceramic, or exposed, depending on requirements. Special sizes, shapes, wattages, voltages, thermocouple access holes and extra long braided leads are available. Contact OMEGALUX Sales department for ordering information. Model Number Wattage Dimensions in inches (mm) Voltage Wt. *These heaters contain two 230 Volt circuits which may be wired in parallel for 230 Volt operation or in series for 460 Volt operation. **Add suffix -E for exposed element construction, same price. †Indicates heater containing two 460 Volt circuits. Only a few part numbers are shown below. Please review Specs/Tables for all available models then use the "Part Number Builder" to order. 6 : 6 5/8 in. 12 : 12 5/8 in. 18 : 18 5/8 in. 24 : 24 5/8 in.